Need the flexibility and control to manage large-scale deployments? Private colocation suites are available in the New York/new Jersey market. Powered by our reliable network backbone, connect quickly and seamlessly with Performance IP and Cloud Connection. Via high power density— our data centers let you fit more gear into a smaller space and reduce your overall footprint. Utilization of air containment and LED lighting amongst other technologies to make our data center as environmentally friendly as possible. Interested in more information or a tour of our NEW YORK/NEW JERSEY data centers? New York, undeniably one of the largest economic centers in the world, and its surrounding region—which includes northern New Jersey and southern Connecticut—is home to 45 companies in the Fortune 500. The region’s INAP data centers offer the high performance that is essential to support these businesses with fast and reliable connectivity to local and global endpoints alike. 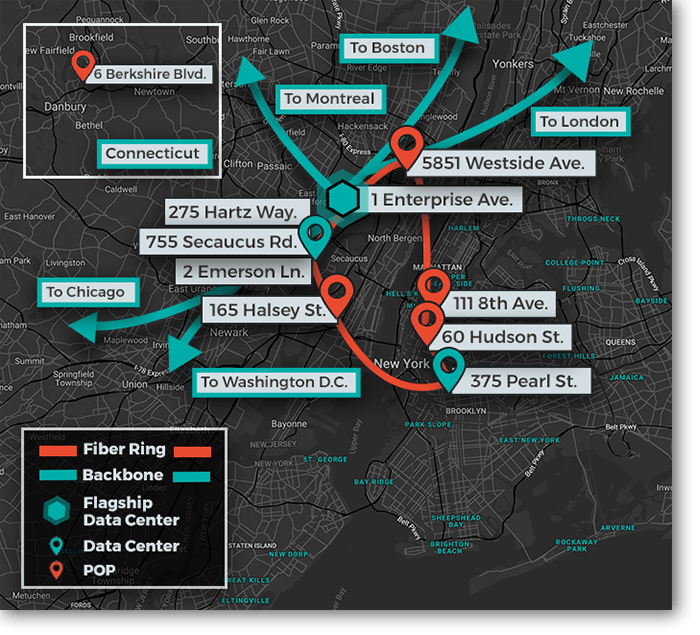 Our New York/New Jersey data centers connect to London, Boston, Montreal, Chicago and Washington, D.C. via our reliable, high-performing backbone. because we know you can't put a price on peace of mind. Our data centers employ redundant and dual-powered servers, storage, network links and other IT components. Maintenance on power and cooling systems can take place without disrupting operations. Data centers are not tied to any one service provider (telecommunications or IS), allowing interconnection between many colocation and interconnection providers. Our data centers are designed with multiple equal power and cooling systems and no single point of failure. Our robust systems ensure the security, availability, confidentiality and privacy of our data centers meet the highest standards. We design our data centers with raised flooring, running cooling underneath to achieve efficient and reliable temperature maintenance. Sub-floor detection, remote monitoring and smoke/heat detection are just some of the ways we provide fire protection. From our large cooling capacity to humidity control, our data centers are designed with environment control strategies in mind. To achieve Tier 3-design and concurrent maintainability in our data centers, we build out full cooling redundancy. State-of-the-art security technology, including video monitoring and recording, is active at all INAP data centers. In addition to security technology, our data centers have human security monitoring the premises. Card access, keypads and PIN systems, in addition to human personnel, secure access at our data centers. To meet compliance standards, including Tier 3-design data center specifications, redundant power sources are incorporated into our facility design. Every INAP data center has a backup generator strategy and redundant power source. Our carrier-neutral stance means every customer can choose from a variety of providers. INAP data centers are equipped with Meet Me Rooms to provide interconnectivity with a diverse variety of carriers.